Saw these guys a couple of weeks ago. Great musicianship! 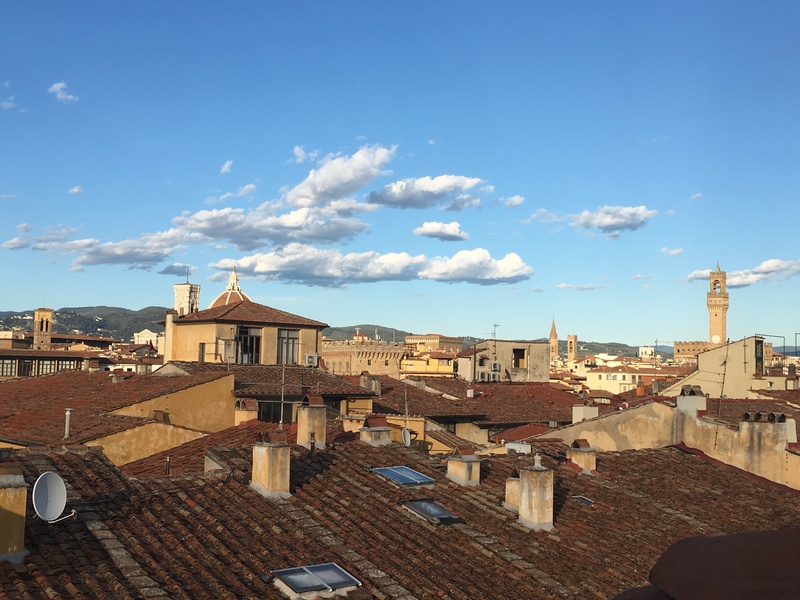 After 6 days in the Tuscan countryside and 5 days in Sicily, we hopped back up to Florence by air, took a short cab ride into town and bedded down there for 4 days. I had never been to Florence before. Triple Wow! Wow One – Man, there are a lot of tourists. I thought that Athens, Rome, London were a bit touristed up. But Florence takes the cake. Not sure why that is. Maybe it’s a bit more compact than Rome or London. And, guys, the tourists are old. I was a relative youngster compared to many. Or, it just might be that I view myself as still in my early thirties. At least people tell me they think I look that young. Wow Two – Damn it’s a charming city. The River Arno, the architecture, the cobbled streets. It’s as if the only changes over the past hundreds of years are store fronts – I mean they couldn’t very well have had a flagship Ferragamo store or Desigual in 1700, could they? Wow Three – The Renaissance. The city just oozes art and culture. Some cities tell a story of joie de vie (Paris), royalty (London), nation-building (Washington). Well, Florence provides a short course in culture, period. The urn outside a flower shop on our street. 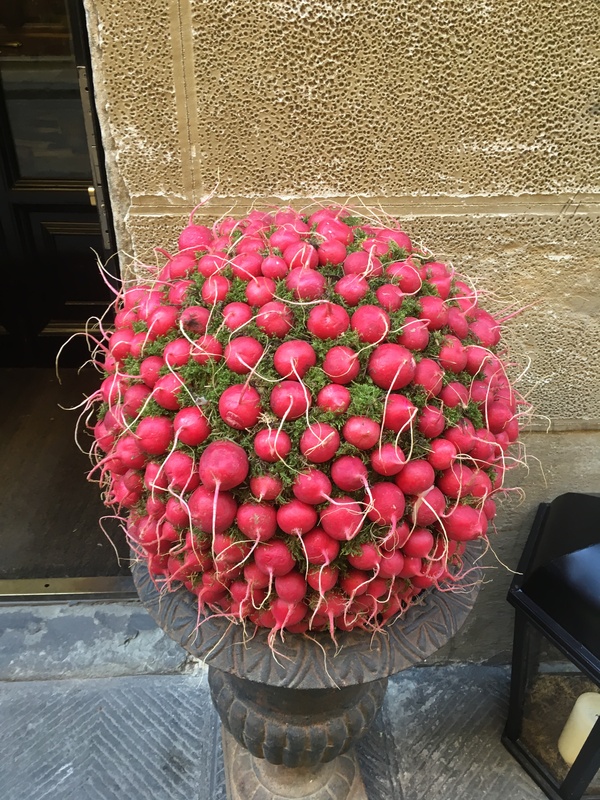 Yes, those are radishes! Uber cool and creative. And, while I’m at it – the fashion! You know those fragrance commercials. You’ve seen them. The ones where there’s some kind of art film scene with a woman melding into the sky while a man stares at his watch. They end together partially naked? Well, people dress and look like that in Florence. It was best captured in a single moment. We were eating dinner in a street-side cafe. A woman rode her bicycle past us. An upright bicycle with a basket, the woman with a flowing mid-length skirt, fashion boots, glistening mane of dark hair. I mean styling’, baby. Audrey Hepburnesque – absolutely stunning. The guys are the same – casually out of control manes of hair, scrubby near-beards, and jackets over open neck shirts. Truly beautiful men. We got neck cramps people watching. We witnessed this same phenomenon in Paris to some degree and even Montreal has a bit of a similar attention to style. It’s an added bonus for Florence and it made us want to shop, unfortunately. We did Airbnb in Florence. Apartment on Via Santo Spirito close to Ponte alla Carraia. From the ground floor, walk up 25 steps to the elevator, take the elevator up three floors, get out and walk down two flights to the apartment. We had out own roof-top terrace which was accessed by walking up three flights of stairs past the elevator, of course. But, it was special returning to the apartment each afternoon and taking some wine, cheeses, bread, olives, etc. up and watching out over the rooftops as the city flips the switch from day to night. The apartment was a bit tired furniture-wise but we didn’t spend much time inside. Airbnb listing here. 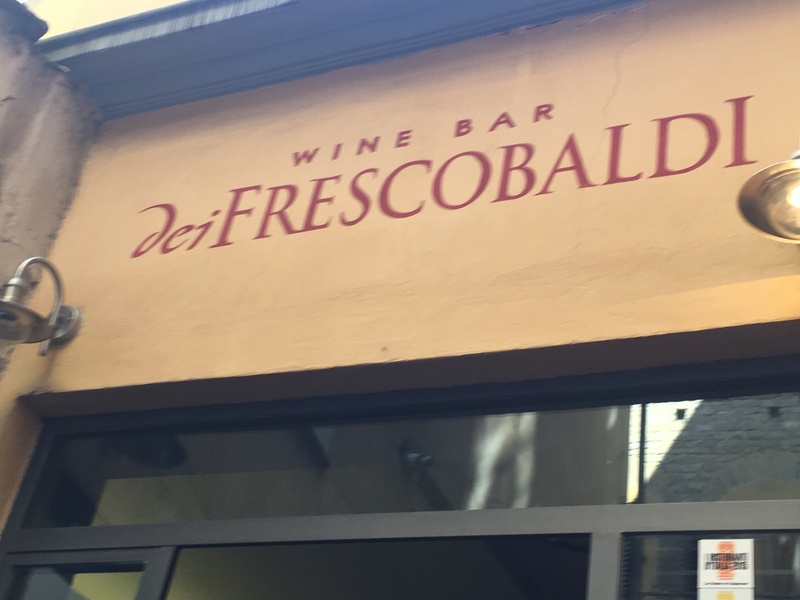 So, what does a wine guy do in Florence? Despite impeccable research – my plans were pretty sketchy. So, I reached out to a fellow wine Tweep – TuscanVines, @JohnMFodera, to ask that very question.. John said, and I’m paraphrasing here, “Get thee to Enoteca Pitti Gola e Cantina. Guys really know their stuff. Rare wines!” That’s what we did. 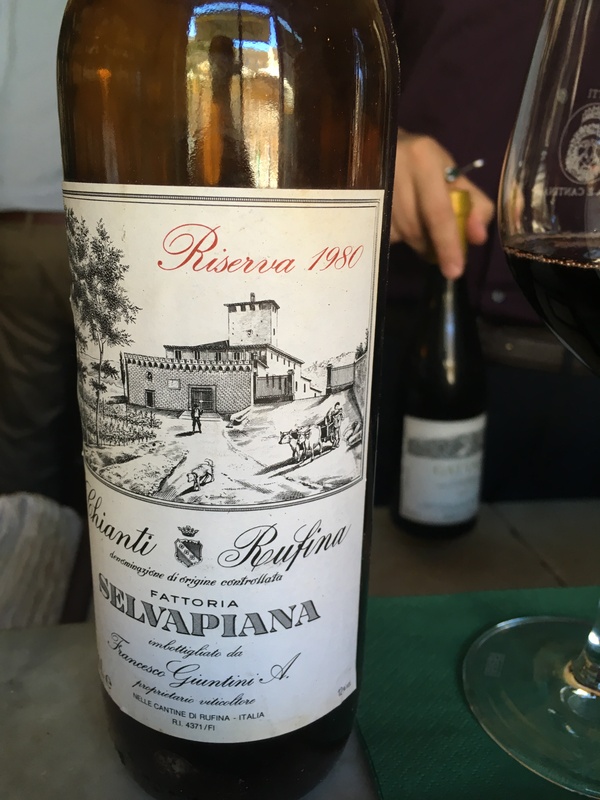 1980 Fattoria Salvapiana Chianti Rufina Riserva – I haven’t ever kept any of my Chianti, Riserva or otherwise, for 36 years (Remember: I’m barely 36 years old myself). So, I didn’t know what to expect. This wine was still packing a lot of flavour. Of course it had settled out much of the tannin but the acidity was still there – mature dried fruits, tobacco – subtle and pleasing. It was Old School. I think it could last for a number of years more. A huge and pleasant surprise. It has encouraged me to leave some of my better Chianti alone longer. 2009 Bucciarelli Chianti Classico Riserva This is made at Antico Podere Casanova in Castellina in Chianti and is organic. These two wines couldn’t be more different. To the point where you might expect that the grapes used weren’t the same variety – Sangiovese. This was in a more modern style – cherry fruit up front on the sniff and continuing right through to the finish. 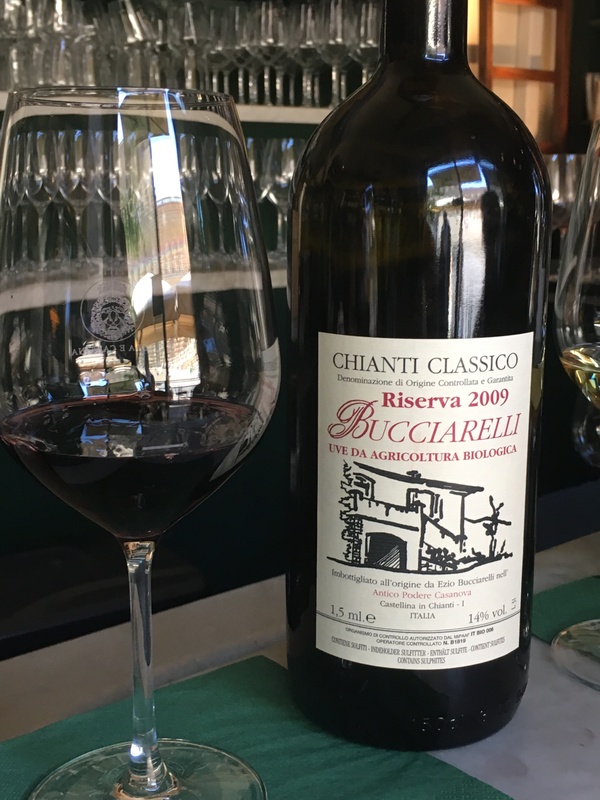 Not a huge wine but elegant and what we’ve all come to expect from Chianti Classico – it’s all-Italian wine. The Director was treated to two whites. 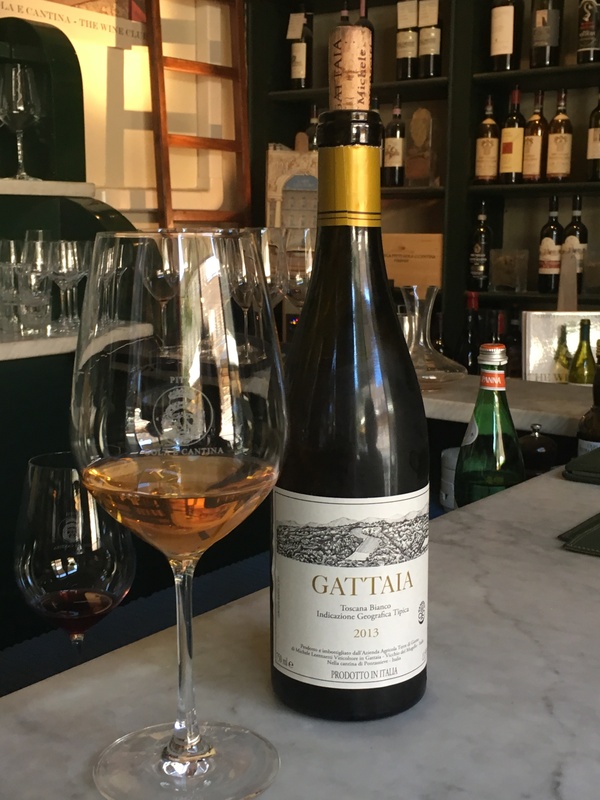 2013 Gattaia Toscana Bianco from Terre di Giotto was a wine that wasn’t in our typical sweet spot. It is 70% Chenin Blanc, 25% Sauvignon Blanc and 5% Sauvignon Gris. It poured and looked like an orange wine. It was very aromatic and started out quite bitter. We asked if it was oaked because it reminded us of wines that take on a bitterness from the oak. But it hadn’t been. It did round out a bit and the bitterness subsided. But not a wine that we would gravitate to. 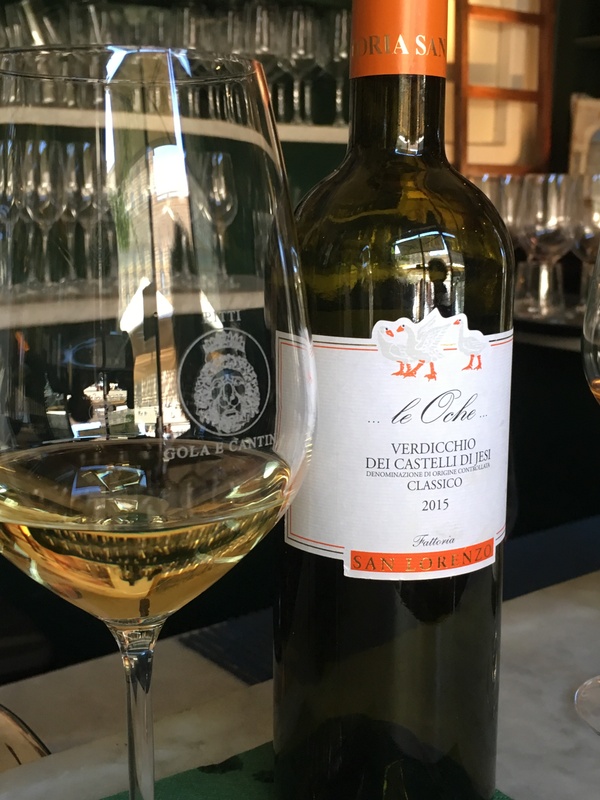 2015 Le Oche Verdicchio dei Castelli di Jesi Classico Superiore – Now, this is what we’re talking about! Maybe it’s me (and, it’s my blog so that’s fair) but I think that Verdicchio is my favourite Italian white on balance. I love Grillo and Arneis but this stuff pushes all the buttons. This wine did not disappoint. It’s texture reminds me of a Riesling with some oiliness or weight – hard to describe. Almonds on the sniff and finish. Lemon zest and pears. Lipsmackingly good. 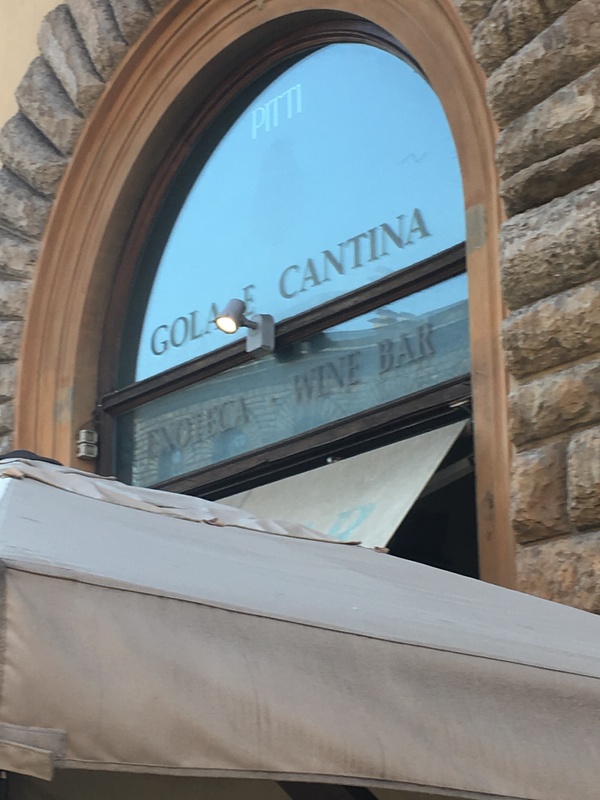 As we were speaking with the proprietor, Edoardo Fioravanti, he asked my opinion on a wine that an agent had dropped off for the cantina’s consideration. It was a label, from Piedmont, that I am very familiar with – their entry-level Barolo – 2013 – and I was excited to try it. In an effort to avoid blow back – I won’t mention the winery. Upon completion of a reasonable amount of time and study, I said, with much trepidation “It’s undrinkable.” And waited…1,2,3. Edoardo said, “You are absolutely right. I cannot believe that they can sell this for that price.” I suggested that, like most Barolo, it just might need time but Edoardo went on to say the he felt that time wouldn’t do much to improve this wine – it was hollow. What a great characterization – bang on. They have a great esoteric collection of wine for purchase as well. 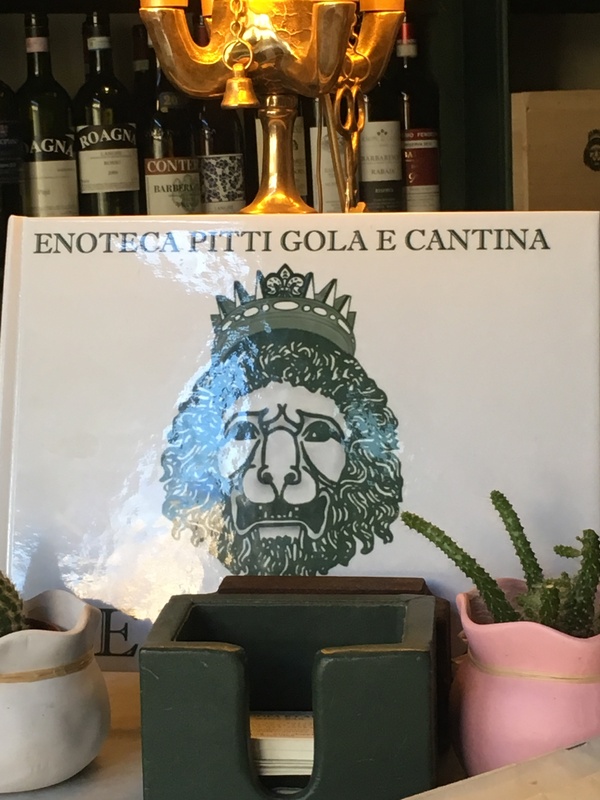 If you get to Florence, Enoteca Pitti Gola e Cantina is a ‘wine’ must. Website here. Thanks, John. 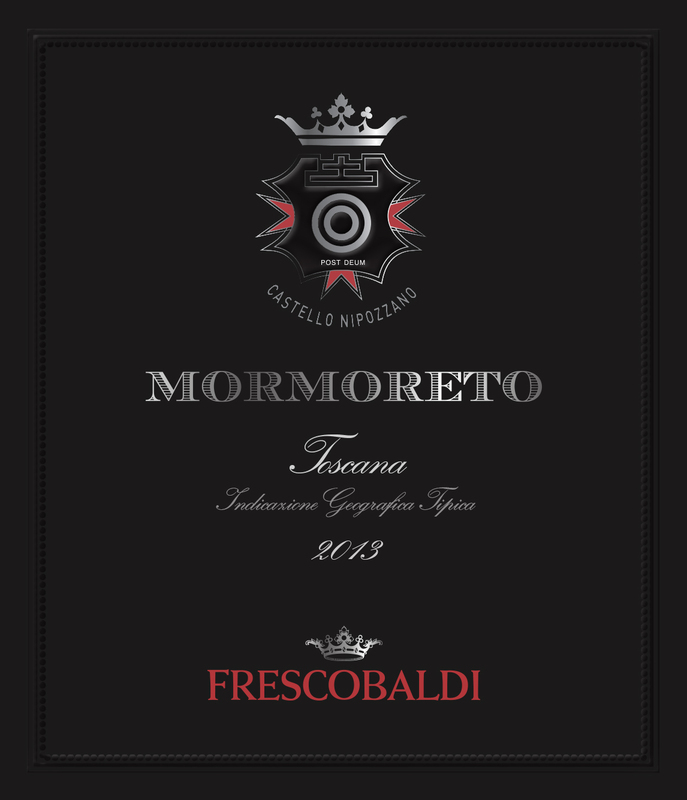 2013 Mormoreto Toscana IGT from Castello di Nipozzano. This is a blend of Cabernet Sauvignon, Cabernet Franc, and Sangiovese with a touch of Petit Verdot from a singe vineyard of the same name (25 hectares) – opaque ruby, beautiful looking wine. And looks matter, don’t kid yourself. Dark berries and espresso on the sniff. A very smooth wine despite its youth – rich, velvety mouthfeel. Some heat from the alcohol (14.5% ABV) and a little not unpleasant nip of bitterness on the finish. Complex and intriguing. If you enjoy deconstructing wine, this is a good one. Or, just enjoy it sans thinking with some pasta in a meaty tomato sauce. 2014 Montesodi Toscana IGT also from Nipozzano is Sangiovese from a single vineyard of the same name (20 hectares). Ruby red but not as opaque as the one above – more crystal and sparkly. This wine had a bit of a hard nose until it sat for a bit. Then it opened with dark berries and balsamic notes. The dark berries continue on the gargle and it finishes off with a nice hit of anise. Surprised by how dark this was – usually look for red cherry/berries with sangiovese. Oak evident but not a real factor – balanced. 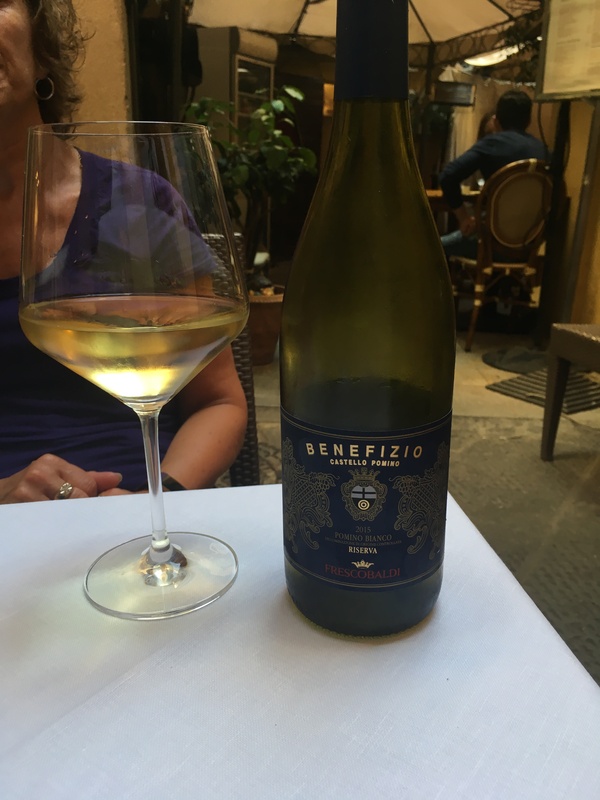 2014 Beneficio Pomino Bianco Riserva DOC We enjoyed the Planeta Chardonnay in Menfi a lot. Well, this was full value against that white. Elegant, rich, deep, peaches and cream, lightly oaked – butter and a citrus snap, lively on the finish. Can I call a Chardonnay sturdy? Built for the cellar. Lovely wine. There were loads more wines to talk about. I might do another post on Italy to cover those. But for now, we returned home with heavy luggage and heavy hearts. Plus, a commitment to return for a long stay in the future. P.S. A quick Happy Thanksgiving to our neighbours. I will toast you all with a pitcher of beer as I watch my Lions lose…..again, I fear.